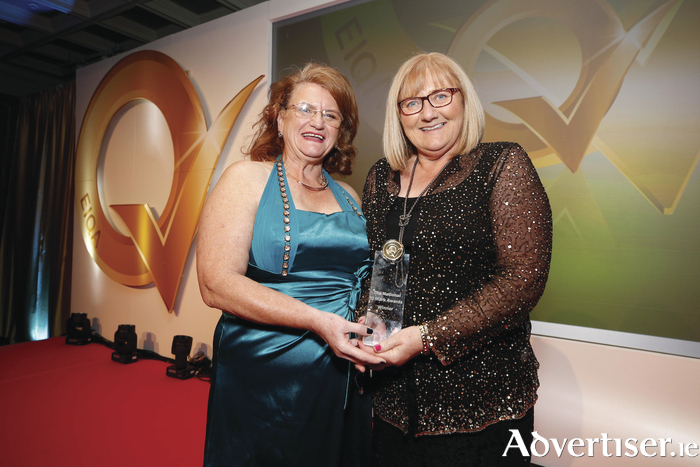 Irene Collins, managing director of EIQA, pictured with Evelyn Lane representing Mayo North East Local Employment Service, winner of the Best Quality Management System (QMS) in the pursuit of excellence at the National Q Mark Awards. Photo: Conor McCabe Photography. Mayo Local Employment Service has won a National Q Mark Award for Best Quality Management System in Local Employment Services at The National Q Mark Awards. The nomination puts it in the top 6.75 per cent of all audits completed by the EIQA on the island of Ireland and this win means it is at the very top of the Q for highest standards of quality and excellence. Mayo Local Employment Service is contracted by the Department of Social Protection to deliver the Pathways to Work activation programme aimed at recipients of Jobseekers Allowance (JSA ) or benefit and additionally to provide a walk-in service to individuals who present themselves to the LES for support by their own choice. Mayo LES has adopted a 'local everywhere' approach and has nine offices dotted around County Mayo manned by 16 permanent staff.